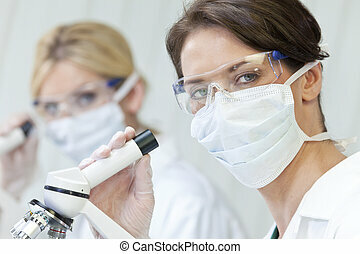 A blond medical or scientific researcher or doctor using looking at a clear solution in a laboratory with her asian female colleague out of focus behind her. 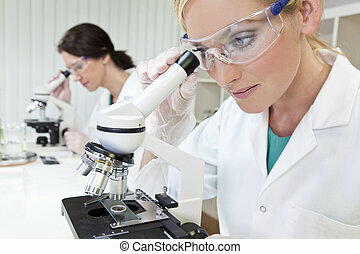 A blond female medical or scientific researcher or doctor using her microscope in a laboratory with her colleague out of focus behind her. 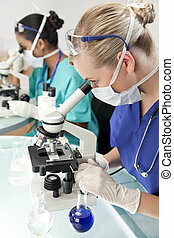 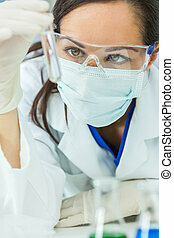 female medical or scientific researcher or woman doctor looking at a test tube of clear solution in a laboratory with her microscope beside her. 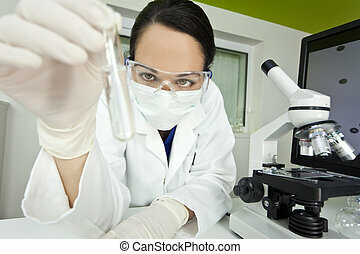 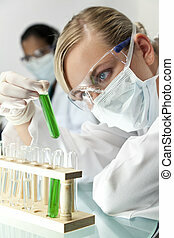 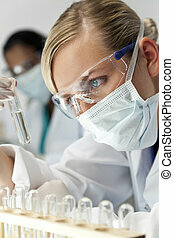 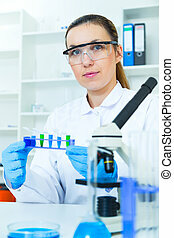 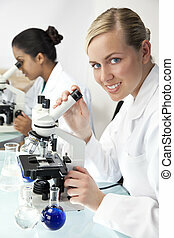 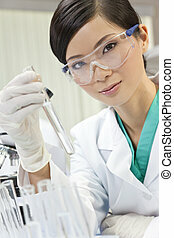 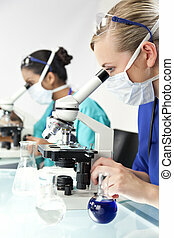 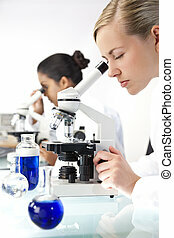 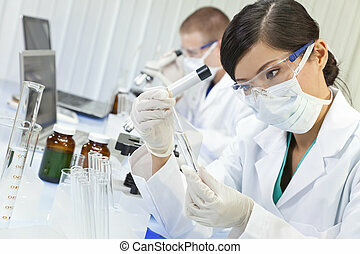 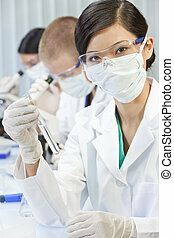 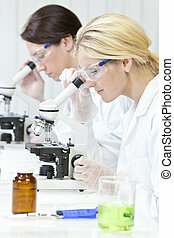 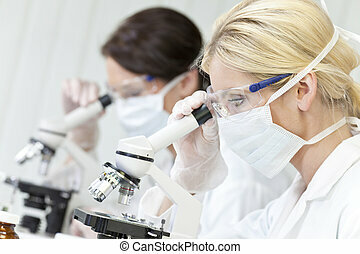 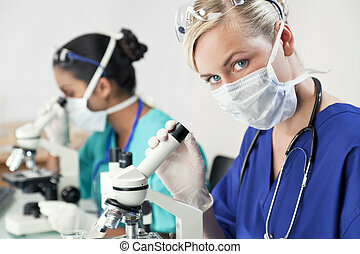 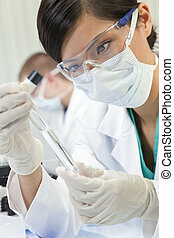 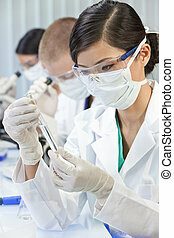 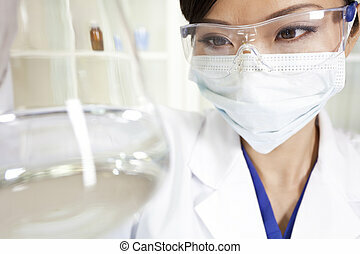 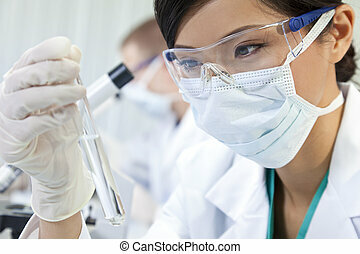 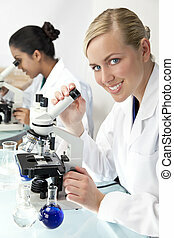 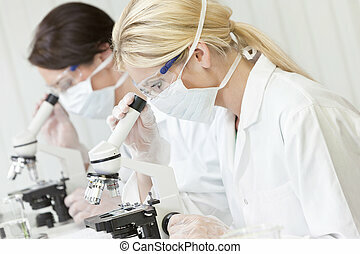 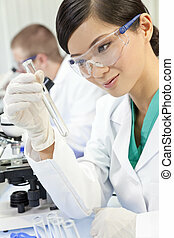 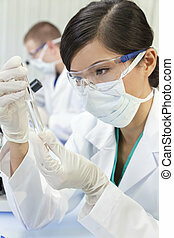 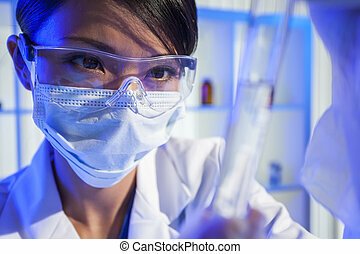 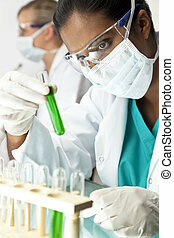 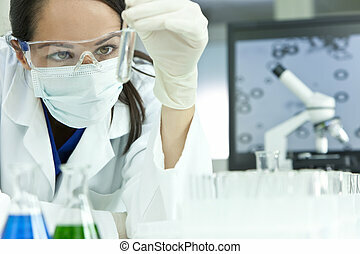 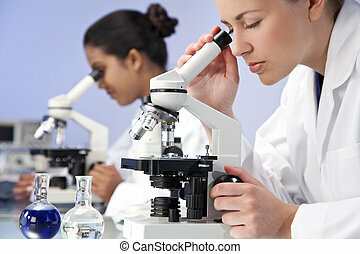 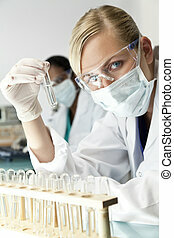 A Chinese Asian female medical or scientific researcher or doctor looking at a flask of clear liquid in a laboratory. 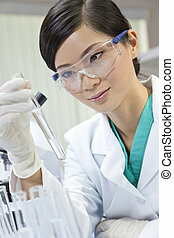 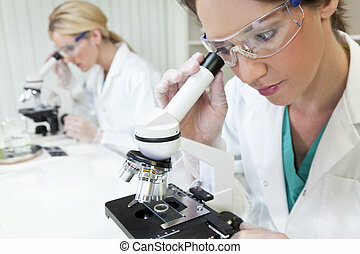 A Chinese Asian female medical or scientific researcher or doctor looking at a test tube of clear liquid in a laboratory. 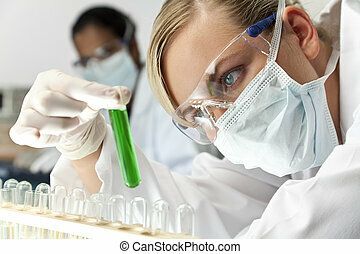 A blond medical or scientific researcher or doctor using looking at a green solution in a laboratory with her Asian female colleague out of focus behind her. 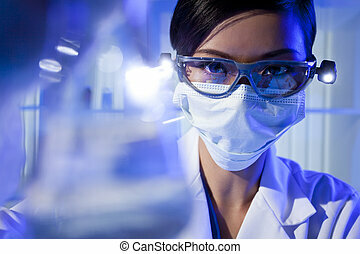 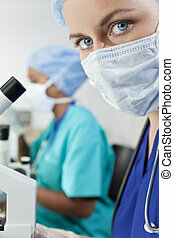 An Asian medical or scientific researcher or doctor using looking at a green solution in a laboratory with her female colleague out of focus behind her. 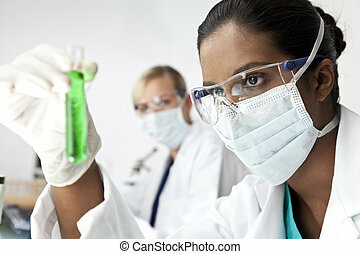 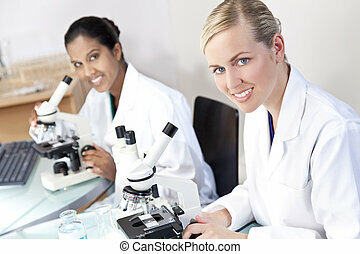 A female medical or scientific researcher or doctor using looking at a green solution in a laboratory with her Asian female colleague out of focus behind her. 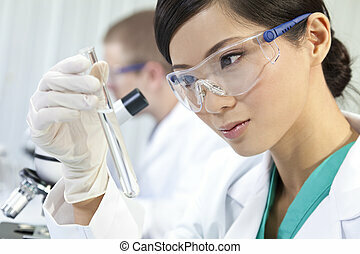 A Chinese Asian female medical or scientific researcher or doctor using looking at a test tube of clear liquid in a laboratory with her colleague out of focus behind her. 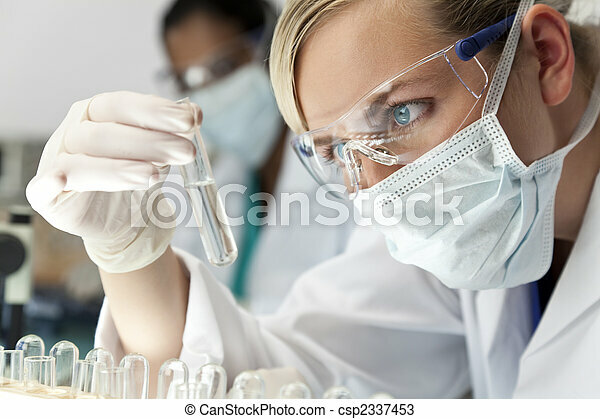 A female medical or scientific researcher or woman doctor looking at a test tube of clear solution in a laboratory with her microscope beside her. 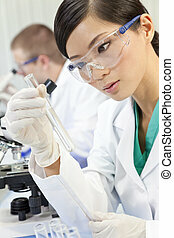 A Chinese Asian female medical or scientific researcher or doctor using looking at a test tube of clear liquid in a laboratory with her colleagues out of focus behind her. 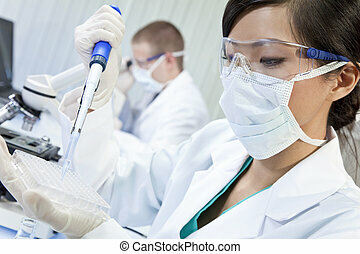 A Chinese Asian female medical or scientific researcher or doctor using a pipette and cell tray in a laboratory with her colleague out of focus behind her.